We hear about cataracts all the time, but it’s less clear that we understand exactly what cataracts are, how they’re detected, and ultimately how to treat them. 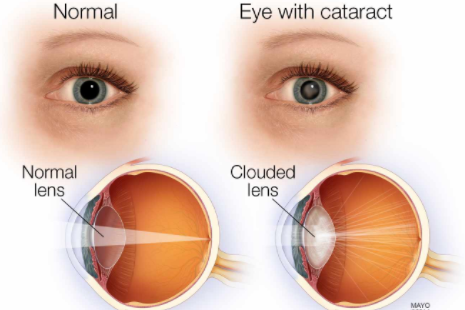 In short, a cataract is a clouding of the lens inside your eye. Cataracts prevent light from focusing clearly inside the eye, disrupting your vision in largely the same way a clouded camera lens disrupts a good photograph. Cataracts are most commonly caused by aging, and as such, develop in almost everyone sooner or later. Even if you’re having trouble seeing very clearly, your eye doctor can very easily see into your eyes and diagnose a cataract by way of routine eye examination. Cataracts don’t generally cause any pain except if they have been allowed to remain untreated for too long. Cataracts that have been gone untreated or undiagnosed can eventually considerable pain and light sensitivity. If you’re experiencing blurred vision, difficulty seeing in dim light, seeing halos around lights, or vision loss, these may be symptoms of a cataract in one or both eyes. A subcapsular cataract occurs at the back of the lens. A cortical cataract is a cataract that occurs in the lens cortex, the part of the lens that surrounds the central nucleus. Beyond avoiding the ancillary causes of cataracts like the ones listed above, generally speaking, there is no sure-fire way to avoid cataracts caused by aging. When cataract symptoms begin to appear, people can often improve their vision for a while with a new prescription for their glasses or contact lens, increased magnification, appropriate lighting or other visual aids. Looking further than a temporary fix, the “cure” for cataracts is a relatively routine outpatient surgery under local anesthesia to remove the lens inside your eye that has become cloudy, and replace it with an artificial lens called an Intraocular Lens or IOL, to restore clear vision. This may not be as simple as a couple eye drops, a couple times a day, but cataract surgery has come a long way, and in most cases, the incision in the eye is so small that the patients recover almost overnight, with little or no discomfort. It’s recommended that you avoid driving a car until your vision is reliably clear, and that you avoid anything that might put undue pressure on your eyes, but beyond that, medical treatment for cataracts is as simple as getting diagnosed early by your eye doctor, and setting a time for the procedure. It’s reported that 9 out of 10 people who have cataract surgery regain very good vision, somewhere between 20/20 and 20/40. Contact us TODAY to set up your routine eye exam or to report any issue or concerns with your vision. Berlin Optical Expressions is your destination for early cataract detection!